Duval County records from 1903 are available locally from the county clerk in the city of San Diego and online through TexasOnline. Certified copies are restricted for 25-75 years (for death and birth certificates respectively), but informational copies have no restrictions. The county clerk in San Diego may be contacted by mail, phone, fax, or in person. Older records may be available at the Texas State Library Genealogy Section of the Texas State Library. 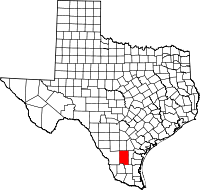 Created from three counties in 1858 (Live Oak, Nueces, and Starr), Duval County began as a Mexican settlement in 1812, displacing the Comanches, who had displaced the Coahuiltecan.